In May, the National Save The Sea Turtle Foundation found an opportunity to be a part of a large-scale recycling endeavor. When the International Game Fish Association (IGFA) in Ft. Lauderdale closed its doors to visitors, the beautiful 12 foot sea turtle educational display that the Foundation donated back in 2001 was closed behind them. The display had been commissioned by NSTSTF and developed to bring a more dynamic and hands-on learning experience to the children who visited the facility. 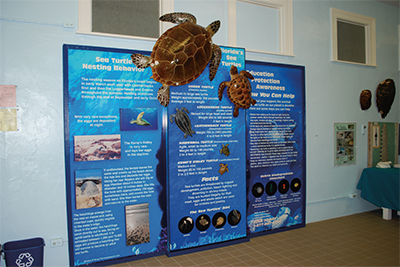 The display highlights the biology of sea turtles while focusing on conservation issues, such as pollution, and how they affect these endangered animals. Despite its 14 year-old minor wear and tear, the display was still in great condition and could continue to serve its purpose elsewhere. At this point, NSTSTF realized the potential value of the display to another educational facility, and chose to recycle-- on a large scale. Frank Wojcik, the Foundation’s President, decided to reach out to their partner on the Treasure Coast, the Environmental Studies Center. Located in Jensen Beach, the Center is part of the Martin County school district and serves as an educational facility for all the children in the County. Roughly 10,000 students pass through its doors each school year. Their curricula focus on marine conservation, and students learn all about sea turtles through artifacts and their resident education loggerhead, Scuttle. 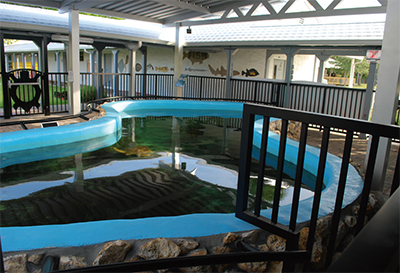 The Center’s outdoor exhibits include a large tank with a live loggerhead sea turtle, with touch tanks and aquariums nearby. The impressive sea turtle display once housed at the International Game Fish Association Museum will now educate students and visitors at the Environmental Studies Center in Jensen Beach. 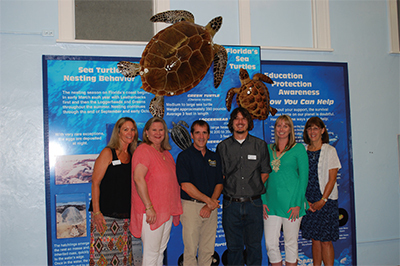 National Save The Sea Turtle Foundation Biologist Larry Wood and Inwater Research Group’s Cody Mott with several Environmental Education Center Board Members at the Exhibit Opening. 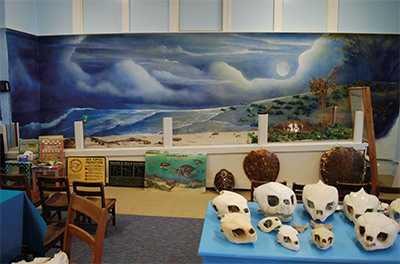 The Environmental Studies Center in Jensen Beach is part of the Martin County School District, and hosts over 10,000 school students per year.